Well, not just yet. Extrapolating here. Online PhD has information about advanced programs that could provide you with the info you need to compete in today’s Internet market. People who think they could be person to develop the software or site that would bump Facebook out of its top slot may be interested in increasing their skills. The student generation is beyond connected .. they’re embedded. Facebook and the social lives / networks of students are so intertwined, those who choose not to participate “fall off the grid” in social interaction. It’s not just just social: Facebook represents the conduit for a wide variety of student activities .. from Senior Skip Day (I remember mine .. there was beer) to school-sanctioned events, oh, like graduation. As to graduation, some schools are distributing information to their students solely via Facebook. It’s not just school activities: students are learning about current events at a pace and participation level not before seen .. students who cannot vote are getting involved. Remember Rock the Vote? This generation wields boulders. We passed notes, met in the cafeteria and made phone calls from our homes. We heard about things from flyers, bulletins and garish signs in the cafeteria (well, it was the 70s). We avoided the table with campaign signs and student volunteers (well, it was the 70s). Always connected, perhaps with surgically-implanted connectivity chips (okay, I’m kidding). Suffice to say that I don’t think the future will suffer a disconnected (or at least, a de-synchronized) user for long. Always relevant to the user. This plays into my “Information Snacking” paradigm, where tomorrow’s home and personalized pages will truly be their own, containing information that is relevant to the page’s owner. Insanely simplified interactive-ness .. the ability to “poke”, alert and engage with other users as a matter of course. Functional expectations (read: demands) of the embedded generation will drive application development to include services from a variety of sources. if Facebook provides all the content and functionality to meet these demands, then Facebook wins. If they don’t, someone else will. I’m a fan of words ..
.. which manifests itself as puns and re-wording, mostly. On re-wording, I’ll grab the part of the word that tickles me the most and re-describe the meaning of the previous sentence .. to the joy / annoyance of my listener. Like these? Want more? Sign up for A Word A Day RSS feed, or subscribe to A Word A Day email newsletter. I’m certain that I am. Even Chuck Norris knows about this site! .. I though they were just being clever .. knight puns, anyone? Get the Facts at Chuck Norris Facts. In the Realm of "I’ll play along"
Yes: according to About.com, I am slightly overweight. That said, 149 pounds is my goal weight? Have you seen my NSFW picture (50th birthday photo shoot)? I would be heroin chique at 149. Really. What are you folks selling? Even more fun: you have an interesting article on your site: "Skinniest Models Banned from Catwalk". Are we over-reporting the news? By "we", I mean all of "we": the media, bloggers, individuals who write to the media and bloggers; anyone who tells (or re-tells) a tale. It seems we’re second-guessing everything that anyone or anything (the stock market, for example) is doing. It seems we’re fan-, celebrity- and politician-obsesses to the point that we’re reporting on the very act of following these people. News stories are now the opinions coming from the common person-on-the-street. Is the information being reported even news? Should the new job of media include the condensation and aggregation all this information into something that can actually be consumed? Is media up to the task? Is "reporting" enough? Should we plead for more analysis .. or should we plead for silence? Seems like everyone is trying too hard. Thanks again (and again) to Jeannine Harsh for discovering Marrakech for the MIX08 team this past year. This is a follow-on post to “My Hedonistic-Healthy Birthday (HHB) Weekend” .. the restaurant and the experience deserve the extra attention. Note that I love off-Strip stuff in Vegas; I drive like a local and am always ready for a new adventure, so please send me your suggestions. Marrakech is only slightly off the beaten track .. less than a mile from the Westin Casuarina, and about a mile from The Strip. It is well worth the walk over. 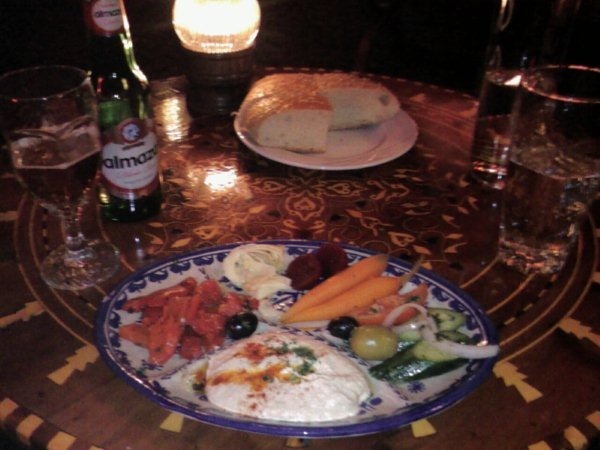 Dine on delicious Moroccan food served in the unique Moroccan manner enhanced by beautiful belly dancers. Stay as long as you wish, there is no rush here. Service begins with washing each persons hands with lightly scented rose water. It successfully sets the stage for the highly anticipated, extravagant six-course meal offered by Marrakech. Once seated, you are presented a towel that will be your friend (and a necessity) throughout the dinner. You then engage in a warm rosewater hand wash and place your drink order (full bar, although no Maker’s Mark .. I had Jack in my introductory Manhattan). The servers will answer any questions about the menu and are especially careful to ask about any food allergies, which I found quite comforting. On the menu: there really isn’t one .. yes they hand you a menu, but it’s essentially FYI. 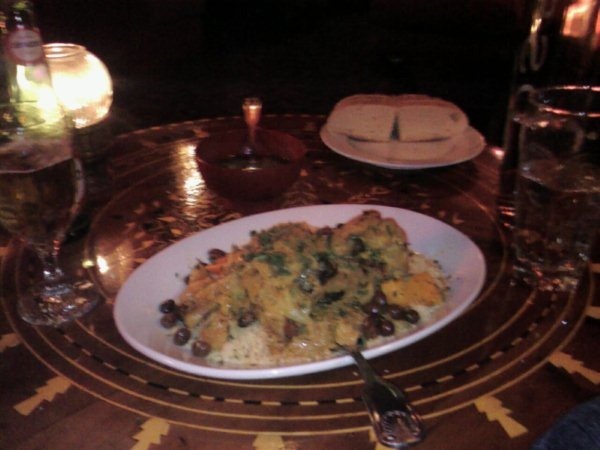 The restaurant serves a six-course Moroccan meal for a bargain prix fixe price of US$40. The belly dancers are complimentary (and to be complimented). The staff offered to explain each course to me as they served it, including describing how best to eat it. If that surprises you, please note that you are in a “no silverware zone” (save for the main course and fabulous dessert). The server will describe the spices and as much detail as you’re willing to absorb about the preparation and history of the course. The meal is served with a freshly-baked loaf of a neutral sesame bread. I was delighted about this, as was able to keep my hands relatively clean. A delightful appetizer of tender shrimp: scampi seasoned in lemon, wine, parsley and garlic. Outstanding. I sopped up the garlic sauce with their amazing bread. I wasn’t going to be speaking with anyone after dinner. 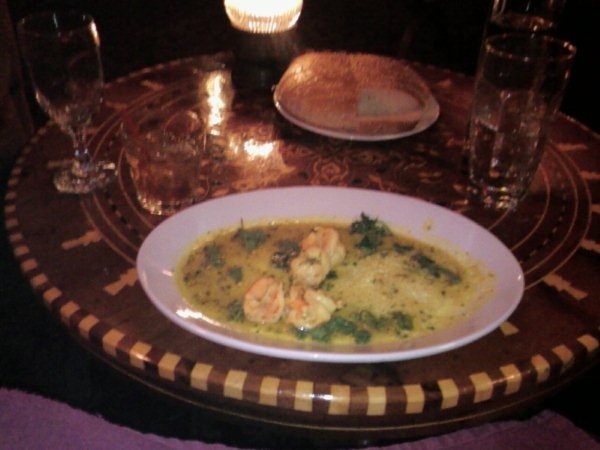 The scampi is followed with Harira Soup: a lentil-and-rice soup with lemon and other spices. Then comes Salade Marrakech: hummus, tomatoes, cucumber, olives and peppers. Incredible. 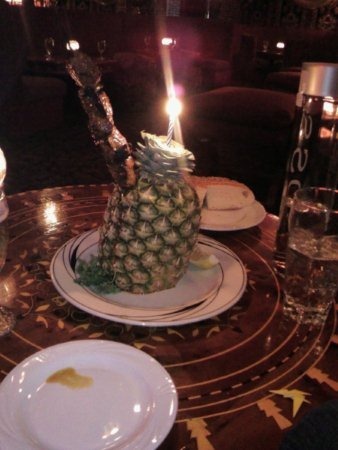 Candle-lit Filet Mignon Shish-Kebob. Tender and delicious. The main course is a Royal Cous Cous platter served with Cornish Game Hen in a traditional raisin-vegetable sauce. This was a real treat (and I was happy to have a fork at this point). 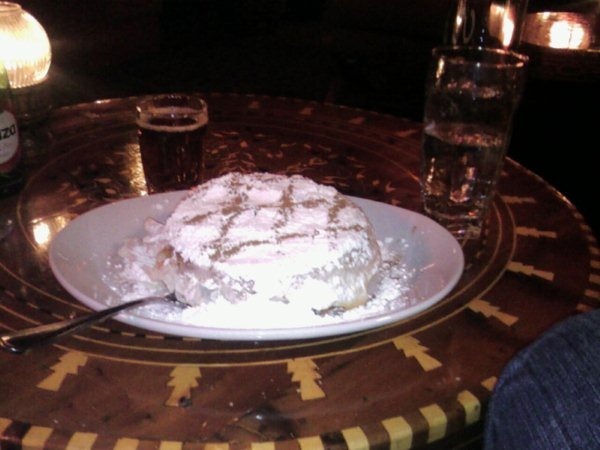 For dessert, B’Stilla, a Moroccan favorite served with a delightful mint tea. The highlight of the meal (for me, anyway). I came here tonight because I wanted another look / taste of this dessert .. it alone is worth the trip. it’s a fillo dough pastry stuffed with walnuts, fruit, cinnamon and powdered sugar. Marrakech makes an impression. Don’t miss a visit the next time you’re in Vegas! Those close to me and read this blog heard me discuss the possibility of a gala event in Las Vegas, tentatively titled “Michael’s Hedonistic-Healthy Fiftieth Birthday Weekend”. Yeah: I am about as effective at product names as is Microsoft. On the hedonistic side: Some all-night gambling and Strip-walking, a show or two, some terrific food. On the healthy side: Walk a lot, sleep in a day or two, extra gym time, pool time, walk some more. However, the lofty plans of mice and men can, well, deflate in the face of reality, schedules and real life. So, in short, the guy trip unraveled, the stand-up broads sat down; you get the drift. In the end, I realized that I just didn’t want to be responsible for anyone’s good time but my own. Selfish? Yeah. I earned it .. for this one weekend, I get to play. Two one-hour sessions on the cross-trainer each day. Pool time, complete with sun and Mai-Tais. Sleep in and take an afternoon nap. Multiple walks, including at least one all-nighter. Dinner at my favorite steak house on The Strip. Dinner at Marrakech (this is as much a fact-finding mission as a meal: I want to make that dessert at home). Lose weight during the trip. Spend only House money during the trip. Two hours on the cross-trainer each day; three hours on two days. :: strut :: Check. Pool time: a bit of a disappointment; relatively bad weather for the pool (wind and temperatures in the low 60s). However, I still managed to get two hours in the last two days .. but, no Mai Tais. With an “A for effort”: Check. I didn’t sleep in or take any naps. I know myself well enough to realize that I feel like I’m missing something when I sleep. Expected behavior. I took lots of walks (check out My SportsDo Activity Blog for October 11-14th, 2008). Sadly, didn’t do the all-nighter .. if you can believe it, I found I was too tired with all the other activity. I’ll make that up on my next working trip to Vegas. Rationalized with reality behavior. Dinner at my favorite steak house on The Strip: the Steakhouse at Bill’s Gamblin’ Hall. It’s in the okay-to-decent realm; no where near over the top. Good food: some table side dishes and a reasonably-priced wine menu. The staff knows me there and takes very, very good care of me. It also has the bonus of being within a block of my hotel, the Westin Casuarina. Check. Dinner at Marrakech. The experience was so much fun, I wrote a separate post, “The HHB Weekend: Dinner at Marrakech” which contains all the details. Check. Spend only house money during the trip. Almost. Room, meals, tips, incidentals: covered with cash. I paid for airfare with miles and upgraded using my card; about $150. The rental car was on a complimentary weekend rental, plus one day at the weekend rate; about $45, with gas. I came home with $200 over my stake. Who da man? Check. The car I hired to take me from the airport back to my hotel after returning my rental car: covered with cash (damn it). Why did I do that crazy thing? Well, left my wallet in the room. Who da dumbass? The crazy crystal cube with my 3D visage in it (I’ll share it, if I can figure out how to take a picture of it): covered with cash. All in all, a wonderful trip and the ideal way for me to have spent my mid-life-point birthday. More Frightening than "Three Little Words"
If you’ve heard me speak, you know I give a quick example (a diatribe, really) about how the new three little words strikes fear into everyone’s hearts. Those words? I mean pictures, videos, messages of, and about you, on the web. Scary? You bet! We are writing to let you know that computer tapes containing some of your personal information were lost while being transported to an off-site storage facility by our archive services vendor. They’re trying to avoid fault by stating “by our archive services vendor“. They’re creating fear by stating “your personal information“, with all the issues surrounding identity theft. They’re assuring us they have remote backups (John and Jane may not get this, but I do), which is usually a good thing. While we have no reason to believe that this information has been accessed or used inappropriately, we deeply regret that this incident occurred and we wanted to explain the precautionary steps we have taken to help protect you. “.. we have no reason to believe that this information has been accessed or used inappropriately”: Optimistic, at best. How do they know if they can’t find the tapes? Are the tapes in their possession now, or are they still missing? If recovered, can they tell if the tapes were read or restored to a system? “We deeply regret“: Wow. An apology (sort of). “.. explain the precautionary steps we have taken ..“: Sorry kids, but precautionary means you planned something in advance, not reacting (as you are) to a situation you (oh, sorry .. your vendor) created. Then comes some background into the kind of information that was lost; in this case, stockholder information for publicly-traded companies. They didn’t specify which companies, however, I’ve only worked for one publicly-traded company, and that was Microsoft. Please note that while the timing of this notice was affected by our forensic investigation into the nature and scope of this incident, based on information received to date, we have no reason to believe your information has been or will be improperly accessed or misused as a result of this incident. “.. timing of this notice was affected by our forensic investigation ..“: what the Hell does this mean? Did they anticipate the data loss and are sending this in advance, or did they want to get the notice into the mail as soon as they discovered the loss? In the finance world, “forensic” typically means the analysis of statements, and logs, cross-referencing them against the universe of facts, like date, time, location, who benefited, etc. “.. we have no reason to believe ..“: Folks: they have no idea. Not sure why they want to say this again (especially in bold). “.. as a result of this incident ..”: “This” incident? There are others? Gawd. “Unbreakable” is a great film in which Samuel L. Jackson plays a physically-challenged cynic. He tells Bruce Willis that when someone has an offer that’s too good to be true it will follow with an ask for a credit card number. Surprise, surprise. No free lunch, in other words. Back to my letter. This vendor (yes; it’s from a vendor) doesn’t ask for a CC number .. in fact, they offer a two-year subscription to their usually-for-pay, identity-theft-protection and credit-notification service as a means to repay for their mishandling of my records. This suddenly raised the question with me: Was my data ever actually lost, or is this just a come-on for their service? I’m a pragmatist, not a cynic .. but I can’t help to think something could be fishy here. Further, what if their Terms of Service (which, nobody reads anyway) includes an indemnity clause that prevents further action against them if I accept the service. This was one ToS I read very, very carefully. Candidly: the cynic in me was (almost) disappointed that it didn’t. Would have made for a far more interesting post. It was offered with no risk (they didn’t ask me for a credit card number). It seems quite comprehensive (i.e., all credit agencies and credit-related actions). It’s quite interactive, including alerts for changes to my credit rating, including inquiries, “potentially negative” events (I had to report a CC lost this past week, and the service notified me).